Bill Betzen's Blog: Salary Differences Increase 9-fold in 3 years between Teachers in low vs high income schools. 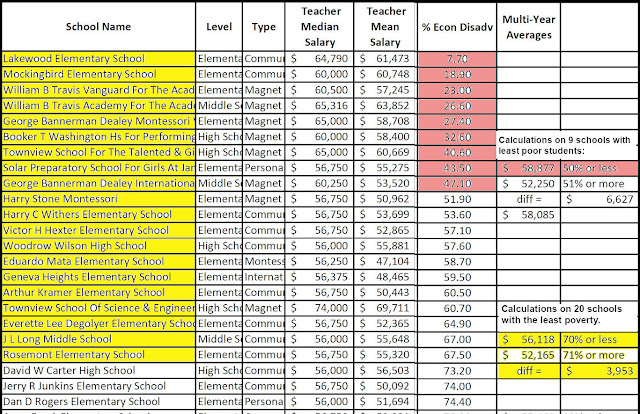 Salary Differences Increase 9-fold in 3 years between Teachers in low vs high income schools. In 2015/16 the difference between teacher salaries in the about 91% of DISD schools with above 70% of students being from high poverty homes, and the about 9% of schools with less than 70% of students being from high poverty homes, was $423. At that time some explained this difference as being due to the higher tenured teachers in these lower poverty schools. Since 2015 teacher raises have been calculated under the Teacher Excellence Initiative (TEI is explained and defined at https://tei.dallasisd.org/ ). By the 2017/18 school year this average teacher salary difference between the 20 "rich" schools and the 210+ "poor" schools had exploded over 9-fold to $3,953. Is that what TEI is supposed to do? The data used in this study was the average teacher salary for every DISD school over the most recent 3 school years: 2015/16, 2016/17 and 2017/18. This data verified a massive 9 fold greater increase over these three school years in the difference in salary between the teachers who teach in the 20 DISD schools with less than 70% of students from economically disabled homes, i.e. the highest percentage of higher income students in 2017/18, and the teachers in the 216 schools with over 70% of children suffering from being "economically disabled." We are looking at average teacher salaries in 2017/18 in the 20 DISD schools with below 70% of students in poverty compared with the income increases for the teachers who teach in the other 216 higher poverty schools, schools with above 70% of children living in poverty. In 2015/16 there were 19 schools with economically disabled student percentages below 70%. The difference between those 19 schools and the remaining 216 with higher levels of poverty was $423 in 2015/16. In 2017/18, under TEI, this difference had exploded over 9-fold to $3,953! Here is a link to the spreadsheet file with three worksheets, one for each of the three school years with all 236 DISD schools listed in order by the percentage of students at each school classified as economically disabled. The order was from the lowest percentage to the highest. Then I used only the first 20 "richest" schools for the 2015/16 and 2017/18 years to calculate the figures I posted above. Here is the link: https://docs.google.com/spreadsheets/d/1y4vYXOKkDHkBmval2AP6Eal5KiugVNiYPn037u--Bfs/edit?usp=sharing. It has the DISD mean teacher salaries by school for the past three years and was received in an open records request. Other observations are welcomed and encouraged! Dallas is being told that the most talented teachers must be in the most needy and difficult schools. That is not happening under TEI based on this data! If DISD wants to defend their claims on TEI, why are they not being more transparent with raw data by school so as to prove their points? Young Women's STEAM Academy at Balch Springs Middle School remains consistently the middle school with the highest School Effectiveness Indices (SEI) scores over the past 3 years in spite of 91.5% of students being economically disabled. Knowing this exceptionally high achievement, it was very good to see that the average teachers salary there has gone up $5,316 over the past three years. They have certainly earned it. 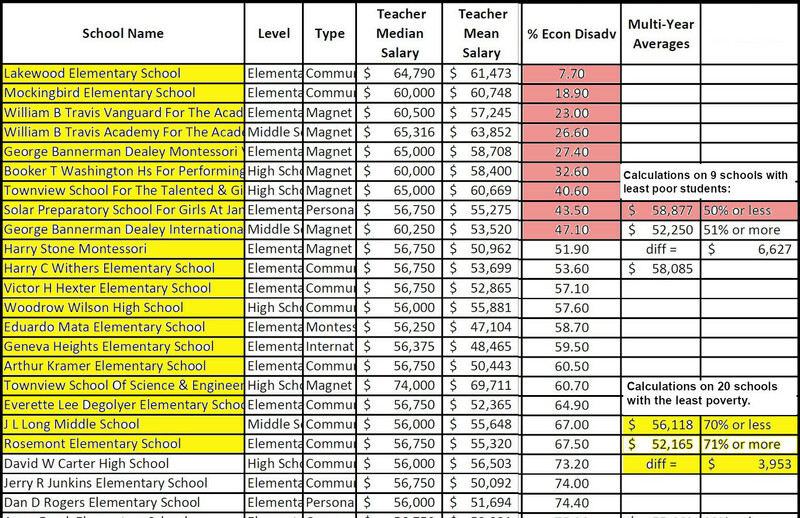 The sad news is that teachers at Young Women's STEAM Academy are still over $3,500 below the average teacher salary in the 9 "richest" Dallas ISD schools with below 50% of students with economic disabilities. NONE of these 9 "richest" schools have an SEI average over the past 2 years that is better than the Young Women's STEAM Academy! Townview TAG was close, but most of these 9 "richest" schools are many points lower! Yet, the teachers in these 9 schools on average received $3,500 more in salary in 2017/18 than the teachers in this significantly higher SEI, 99% minority, 91.5% economically disabled school in Pleasant Grove.